After 4,000 miles, if you feel the product did not eliminate stiction, or improve your trucks stiction symptoms, send in your receipt and/or UPC code from the label, along with your address and phone number. We will mail you a check as a full refund. If you feel the product helped somewhat, but you are still having stiction symptoms, you may request a second bottle free of charge, instead. Please allow 2 to 3 weeks for processing. I saw the trio on Amazon…do I really need all of that? When would/should I need the trio? The Tune Up Trio is made up of 3 great Hot Shot’s Secret products. Stiction Eliminator is an oil additive that will eliminate stiction and clean everything the oil comes in to contact with, including the turbo, Oil cooler, and oil pump; Diesel Extreme is a diesel fuel additive that offers an intense cleaning treatment that is recommended only twice a year. This formula will clean the fuel side of your engine including the carbon that forms on the tips and internal diesel injector deposits that affect injector performance. 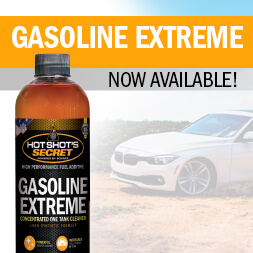 In addition is contains lubricity, cetane boost and fuel stabilizers. FR-3 is an oil additive to be used during the next oil change after the system has been cleaned out by the Stiction Eliminator. The FR-3 will decrease wear and increase fuel economy. 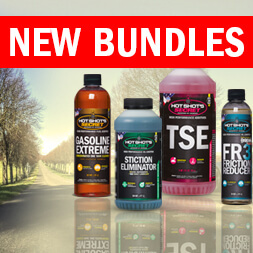 When used together, these three products will keep the engine running smoothly. Are there different products for automobiles vs. pick-ups vs. RV’s? Are there any long-term concerns when using HSS Stiction Eliminator? Our company bought a bunch of HSS Stiction Eliminator and DE and we used it in our 6.0’s and 7.3’s. It worked for some of the trucks but some of the trucks had other issues that your products couldn’t fix. Now my boss is blaming me for talking him into buying your products and won’t let me reorder. I’ve used your products and believe they work – What advice could you give me to sell him on your products again. Nine out of 10 times Stiction Eliminator will solve the problem. We are so confident with the results of this product that we offer a money back guarantee because we realize that sometimes there may be a mechanical error with the injectors that are causing them not to work properly. The product affects all trucks differently, it just depends on how much stiction has built up in the engine. Sometimes, a second bottle is necessary to completely clean out the build-up. Are there any benefits or dangers in using HSS Stiction Eliminator in no-HEUI equipped engines? There are no dangers. In fact, Stiction Eliminator helps to clean and lubricate everything that comes in to contact with the oil. You will notice a quicker turbo spool time from removing the stiction on the turbo shaft. Piston rings will free up causing a better seal for better economy and power with less oil consumption. Oil galleries will clean up and you will decrease wear which will increase the life of your engine. Will HSS Stiction Eliminator help clear up issues with the spool valve? Yes, since the spool valve is in contact with the oil, Stiction Eliminator will clean any stiction on the spool valve to ensure your injectors are working properly. I used a 2 qt. bottle of HSS Stiction Eliminator in my ’06 Duramax. I’m getting close to the oil change mark (5k) and I haven’t seen any change in my #7 injector balance rate. The web states HSS should work in 4k miles but does it take longer on the Duramax since it’s not a high-pressure oil system? In the Duramax LB7 motors, Stiction Eliminator and Diesel Extreme will clean the engine from both sides. It has been our experience that with the LB7 engine, internal diesel injector deposits are many times the root cause of injector problems. Many times, we hear back from customers that injector balance rates are brought back into spec along with a reduction in injector noise. The Stiction Eliminator will clean the oil side including the turbo and oil cooler. I ordered a 5 gallon drum but it did not come with a pump … can I get one from you or can your point me in the right direction where to get one…I have looked them up and there seem to be many different ones. We do not offer/sell any kind of pump, the ones you see online will work fine. *Stiction Eliminator is compatible with any Group II conventional, Group II and III semi-synthetic, Group III synthetic or Group IV PAO full synthetic oil. Do I need to add a cleaner/flush before I change oil brands? I have used Marvel Mystery oil and Lucas fuel additives. I am very interested in Blue Diamond oil. No, Blue Diamond oil and all Hot Shot’s Secret oil additives are fully compatible with all oils. Are all your products compatible with VW diesel engines? Stiction Eliminator, FR3, Diesel Extreme and Everyday Diesel Treatment can be used in any diesel engine. All our diesel fuel additives meet the latest Tier 4 specifications. Are your products safe to run in new trucks? I have ordered HSS Stiction Eliminator and DE and want to know if there are any cautions. My ’04 Dodge starts a little slow, idles rough, misses at app 1500-1800 rpms, makes the “ticking/sticking” noise especially when it’s cold. Can you use HSS Stiction Eliminator and REVX at the same time? While Stiction Eliminator is compatible with Rev-X, we do not recommend mixing additives.